#FindAnAED Campaign – What is it and why AED Awareness is Important | #FindAnAED Campaign – What is it and why AED Awareness is Important – All Safe HSE Protecting Staff, Environment, Property and Investments. AED stands for Automated External Defibrillator, it can save someone’s life who is in cardiac arrest, a situation where the heart no longer beats normally. The AED is needed to ‘shock’ the heart into stopping momentarily so that it can start beating normally once more, and without an AED a patient may die. In order for an AED to save the life of someone in cardiac arrest, you need to know where they are, and most people don’t. Every minute wasted searching for an AED is precious time for a person in need; every second lost adds to the potential for permanent brain damage, and another step closer to death. The #FindAnAED Campaign works to help people become aware of where AEDs are found and gets them thinking about where they could find one if they needed it. 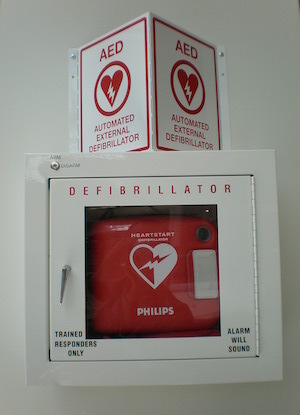 One of the easiest ways you can participate is by being on the lookout for AED’s. Begin to take note of these locations and create a broader AED awareness for yourself and those around you. Why not participate in the #FindAnAED campaign with others? Get your team involved or make finding an AED a fun activity to do with the whole family while you are out and about! Anyone and everyone can use an AED – it is a device that is simple to use and will assist you throughout the process of an emergency. There is no need to be afraid of wondering when an emergency occurs, all that matters is whether or not you are prepared. Contact us to learn more about how to use an AED.